Yaygın bir Avrupa geniş ekran standardı; doğal Super 16 mm film. Bir resmin çerçeve oranı eni ve boyu arasındaki oransal ilişkiyi tarif eder. no matter how big or small the image is, if the width is divided into x units of equal length and the height is measured using this same length unit, the height will be measured to be y units. For example, consider a group of images, all with an aspect ratio of 16:9. One image is 16 inches wide and 9 inches high. Another image is 16 centimeters wide and 9 centimeters high. A third is 8 yards wide and 4.5 yards high. Sinema salonlarındaki filmlerin sunuşunda, günümüzde kullanılan en yaygın çerçeve oranı 1.85:1 ve 2.39:1'dir. Yaygın iki videografik çerçeve oranı; 20. yüzyılın evrensel video formatı olan 4:3 (1.33:1) ile yüksek çözünürlüklü televizyon ve Avrupa dijital televizyonu için evrensel olan 16:9'dir (1.77:1). Başka sinema ve video çerçeve oranları da vardır, fakat seyrek olarak kullanılır. Sinema formatlarında, dişli performasyonların arasındaki film alanının fiziksel boyutu resmin boyutunu belirler. Evrensel standart, (1892'de William Dickson ve Thomas Edison tarafından kurulan) dört perforasyon yüksek olan bir çerçevedir. Filmin kendisi 35 mm genişliğindedir (1,38 inç), fakat perforasyonlar arasındaki alan 4:3 veya 1.33:1 "de facto" oranını bırakarak 24,89 mm×18,67 mm'dir (0,980 inç×0,735 inç). 4:3 oranı 4:3,075 olan (hemen hemen aynı) 155°h x 120°v insan gözü için görüş açısını taklit eder. With a space designated for the standard optical soundtrack, and the frame size reduced to maintain an image that is wider than tall, this resulted in the Academy aperture of 22 mm × 16 mm (0.866 in × 0.630 in) or 1.37:1 aspect ratio. The motion picture industry convention assigns a value of 1.0 to the image’s height; thus, an anamorphic frame (actually 2.39:1) is described (rounded) as 2.40:1 or 2.40 ("two-four-oh"). In American cinemas, the common projection ratios are 1.85:1 and 2.40:1. Some European countries have 1.66:1 as the wide screen standard. The "Academy ratio" of 1.37:1 was used for all cinema films until 1953 (with the release of George Stevens's Shane in 1.66:1). During that time, television, which had a similar aspect ratio of 1.33:1, became a threat to movie audiences, Hollywood gave birth to a large number of wide-screen formats: CinemaScope (up to 2.66:1), Todd-AO (2.20:1), and VistaVision (initially 1.50:1, now 1.66:1 to 2.00:1) to name just a few. The "flat" 1.85:1 aspect ratio was introduced in May, 1953, and became one of the most common cinema projection standards in the U.S. and elsewhere. Super 16 mm film is frequently used for television production due to its lower cost, lack of need for soundtrack space on the film itself (as it is not projected but rather transferred to video), and aspect ratio similar to 16:9 (the native ratio of Super 16 mm is 15:9). It also can be blown up to 35 mm for theatrical release and therefore is sometimes used for feature films. Standart televizyon için 4:3 (1.33:1) (genellikle "Dörde Üç" olarak okunan) has been in use since the invention of moving picture cameras and many computer monitors used to employ the same aspect ratio. 4:3 was the aspect ratio used for 35 mm films in the silent era. It is also very close to the 1.375:1 aspect ratio defined by the Sinema Sanatları ve Bilimleri Akademisi as a standard after the advent of optical sound-on-film. By having TV match this aspect ratio, movies originally photographed on 35 mm film could be satisfactorily viewed on TV in the early days of the medium (i.e. the 1940s and the 1950s). When sinema attendance dropped, film endüstrisini televizyondan farklılaştırmak amacıyla Hollywood geniş ekran çerçeve oranlarını (daha önce bahsedilen 1.85:1 oranı gibi) oluşturdu. Fakat However since the start of the 21st century broadcasters worldwide are phasing out the 4:3 standard entirely, as technology started to favour the 16:9/16:10 aspect ratio of all modern HD TV sets, computer monitors as well as broadcast cameras. 16:9 (1.77:1) (genellikle "On Altıya Dokuz" olarak adlandırılan) HDTV, standart dijital televizyon ve PALplus analog geniş ekran televizyonun uluslararası standart formatıdır. Japonya'nın Hi-Vision'ı aslında 5:3 oranla başladı, fakat uluslararası standartlar grubu daha geniş bir 5⅓'e 3 oranını (=16:9) tanıtınca dönüştürüldü. Çok sayıda dijital video kamerası 16:9'da kayıt edebilme yeteneğine sahip ve 16:9 yalnızca geniş ekran çerçeve oranı doğallıkla is the only widescreen aspect ratio natively supported by DVD standardı tarafından doğallıkla desteklenen . DVD producers can also choose to show even wider ratios such as 1.85:1 and 2.39:1 within the 16:9 DVD frame by hard matting or adding black bars within the image itself. 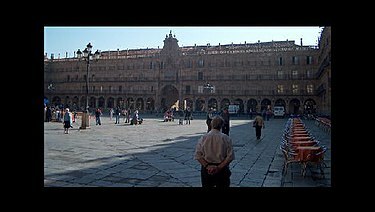 Some films which were made in a 1.85:1 aspect ratio, such as the U.S.-Italian co-production Man of La Mancha, fit quite comfortably onto a 1.77:1 HDTV screen and have been issued anamorphically enhanced on DVD without the black bars. Often, screen specifications are given by their diagonal length. The following formulae can be used to find the height (h), width (l for length) and area (A), where r stands for ratio and d for diagonal length. Comparing two different aspect ratios poses some subtleties – when comparing two aspect ratios, one may compare images with equal height, equal width, equal diagonal, or equal area. More amorphous questions include whether particular subject matter has a natural aspect ratio (panoramas being wide, full-length images of people being tall), or whether a particular ratio is more or less aesthetically pleasing – the golden ratio (~1.618) is seen as especially pleasing. Of common display formats, 16:10 (8/5) is the closest to the golden ratio, and 15:9 is the closest film format. Given the same diagonal, the 4:3 screen offers more (over 12%) area, because it is closer to square (which maximizes area given a diagonal). For CRT-based technology, an aspect ratio that is closer to square is cheaper to manufacture. The same is true for projectors, and other optical devices such as cameras, camcorders, etc. For LCD and Plasma displays, however, the cost is more related to the area, so producing wider and shorter screens yields the same advertised diagonal but lower area, and hence is more profitable. 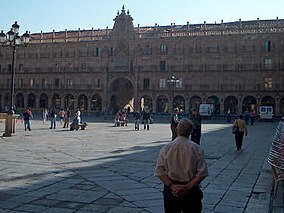 The following compares crops of a given image at 4:3 and 16:9, with different parameters equal; note that in terms of subject, the squarer aspect ratio emphasizes the public square, while the wider aspect ratio emphasizes the wide building. 1.19:1: Sometimes referred to as the Movietone ratio, this ratio was used briefly during the transitional period when the film industry was converting to sound, from 1926 to 1932 approx. It is produced by superimposing an optical soundtrack over a full-gate 1.33 aperture in printing, resulting in an almost square image. Films shot in this ratio are often projected or transferred to video incorrectly using a 1.37 mask. Examples of films shot in the Movietone ratio include Sunrise, M and Hallelujah!. 1.33:1 (4:3, 12:9): 35 mm original silent film ratio, today commonly known in TV and video as 4:3. Also standard ratio for MPEG-2 video compression. This format is still used in many personal video cameras today and has influenced the selection or design of other aspect ratios. It is the standard 16 mm and Super 35mm ratio. 1.37:1: 35 mm full-screen sound film image, nearly universal in movies between 1932 and 1953. Officially adopted as the Academy ratio in 1932 by AMPAS. Rarely used in theatrical context nowadays, but occasionally used for other context. 1.44:1: IMAX format. Imax productions use 70 mm wide film (the same as used for 70 mm feature films), but the film runs through the camera and projector horizontally. This allows for a physically larger area for each image. 1.50:1 (3:2, 15:10): The aspect ratio of 35 mm film used for still photography when 8 perforations are exposed. Also the native aspect ratio of VistaVision, for which the film runs horizontally. 1.55:1 (14:9): Widescreen aspect ratio sometimes used in shooting commercials etc. as a compromise format between 4:3 (12:9) and 16:9. When converted to a 16:9 frame, there is slight pillarboxing, while conversion to 4:3 creates slight letterboxing. All widescreen content on ABC Family's SD feed is presented in this ratio. 1.85:1: 35 mm US and UK widescreen standard for theatrical film. Introduced by Universal Pictures in May, 1953. Projects approximately 3 perforations ("perfs") of image space per 4 perf frame; films can be shot in 3-perf to save cost of film stock. 2.00:1: Original SuperScope ratio, also used in Univisium. Used as a flat ratio for some American studios in the 1950s, abandoned in the 1960s, but recently popularized by the Red One camera system. In 2001 Studio Ghibli used this framing for its animated film Spirited Away. 2.10:1 (21:10): Planned futuristic aspect ratio for television and theatrical films. 2.37:1 (64:27 = 43:33): As of 2010, TVs have been introduced with this aspect ratio and are marketed as "21:9 cinema displays", the first of which was the Philips Cinema 21:9 TV. This aspect ratio is not recognized by storage and transmission standards. 2.39:1 (~12:5): 35 mm anamorphic from 1970 onwards. Aspect ratio of current anamorphic (wide-screen) theatrical viewings. Often commercially branded as Panavision format or 'Scope. Specified as 2.40:1 for Blu-ray Disc film releases (1920×800 resolution). 2.76:1 (~11:4): Ultra Panavision 70 (65 mm with 1.25× anamorphic squeeze). Used only on a handful of films between 1962 and 1966, such as the Battle of the Bulge (1965). 2.93:1: MGM Camera 65, an early version of Ultra Panavision used up until 1962 which used a 1.33× anamorphic squeeze instead to produce a wider aspect ratio. Used only on a few early Ultra Panavision films, most notably Ben-Hur (1959) and also for some sequences of How The West was Won with a slight crop to 2.89:1 when converted to three strip Cinerama. 12.00:1: Circle-Vision 360° developed by the Walt Disney Company in 1955 for use in Disneyland. Uses nine 4:3 35mm projectors to show an image that completely surrounds the viewer. Used in subsequent Disney theme parks and other past applications. Original Aspect Ratio (OAR) is a home cinema term for the aspect ratio or dimensions in which a film or visual production was produced – as envisioned by the people involved in the creation of the work. As an example, the film Gladiator was released to theaters in the 2.39:1 aspect ratio. It was filmed in Super 35 and, in addition to being presented in cinemas and television in the Original Aspect Ratio of 2.39:1, it was also broadcast without the matte altering the aspect ratio to the television standard of 1.33:1. Because of the varied ways in which films are shot, IAR (Intended Aspect Ratio) is a more appropriate term, but is rarely used. is the classic square image, and is available as a choice in some digital still cameras, and harkens back to the days of film cameras when the square image was somewhat popular with photographers using medium format cameras shooting 120 film rolled onto spools. The 6 × 6 cm image size was the classic 1:1 format in the recent past. 120 film can still be found and used today. The reason for DSLR image sensors being the flatter 3:2 versus the taller point-and-shoot 4:3 is that DSLRs were designed to match the legacy 35 mm SLR film, whereas the majority of digital cameras were designed to match the predominant computer displays of the time, with VGA, SVGA, XGA and UXGA all being 4:3. Widescreen computer monitors did not become popular until the advent of HDTV which uses a 16:9 image aspect ratio. 3:1 is another format that can find its roots in the APS film camera. Known as APS-P (30.2 × 9.5 mm), with the -P" denoting "Panorama", the 3:1 format was used for panorama photography. The APS-P panorama standard is the least adhered to of any APS standard, and panoramic implementation varies with by manufacturer on different cameras, with the only commonality being that the image is much longer than it is tall, in the classic "panorama" style. Common print sizes in the ABD (in inches) include 4×6 (1.5), 5×7 (1.4), 4×5 and 8×10 (1.25), and 11×14 (1.27); large format cameras typically use one of these aspect ratios. Medium-format cameras typically have format designated by nominal sizes in centimeters (6×6, 6×7, 6×9, 6×4.5), but these numbers should not be interpreted as exact in computing aspect ratios. Print sizes are usually defined by their portrait dimensions (tall) while equipment aspect ratios are defined by their landscape dimensions (wide, flipped sideways). A good example of this a 4×6 print (6 inch wide by 4 inch tall landscape) perfectly matches the 3:2 aspect ratio of a DSLR/35 mm, since 6/2=3 and 4/2=2. ^ a b c 2.39:1 oranı çoğunlukla 2.40:1 olarak etiketlenir; örneğin, Amerikan Görüntü Yönetmenleri Cemiyeti'nin Amerikan Görüntü Yönetmeni El Kitabı'nda (Many widescreen films before the 1970 SMPTE revision used 2.35:1). "NEC Monitor Technology Guide". 2006-05-21 tarihinde kaynağından arşivlendi. Erişim tarihi: 2006-07-24. Wikimedia Commons'ta Çerçeve oranı ile ilgili medyaları bulabilirsiniz. Bu sayfa son olarak 16 Ocak 2019 tarihinde ve 19.57 saatinde düzenlenmiştir.